Customize policy and procedures manuals, reference materials, frequently used documents or reports, and store them away in any file drawer with this hanging binder. 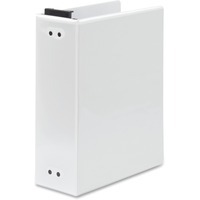 Designed to store large reports easily, this vinyl binder features heavy duty view covers and retractable hooks which pull out to hang and retract when not needed. Inside pockets are designed to keep loose sheets secure, even when the binder is hanging. Unique, Flip Lock mechanism lets you add sheets from front or back of binder. Binder also features exposed rivets and a sturdy chipboard core.